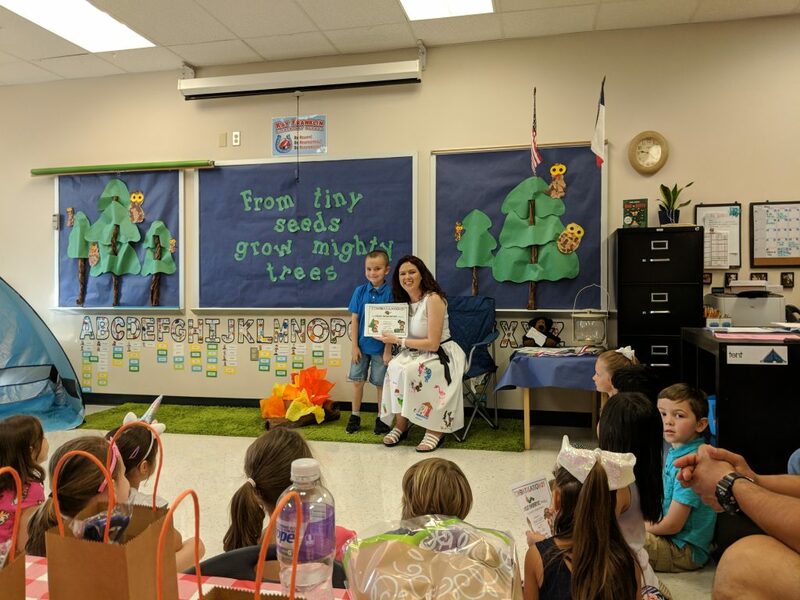 Weekly Happenings: This past week contained some fun things: Joseph’s end-of-the-year awards ceremony, another trip to the zoo, the last few days of school, and the start of summer vacation. The Weekly Weather: Sort of a rinse-and-repeat of the week before: hot, humid, and sunny. 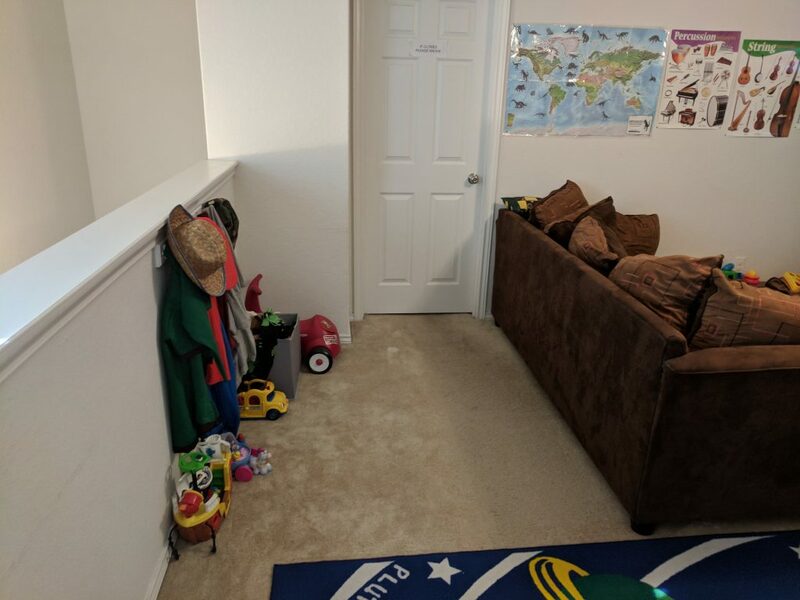 What Paul’s Been Up To: He rearranged the furniture in the loft, moving the couch away from the ledge (since Abigail is showing signs of crawling). He’s also been busy with work and school (he was able to take the day off on Monday to attend Joseph’s awards ceremony, which was really nice). What Sarah’s Been Up To: I got to go hang out with friends one night, which was a nice break from the mundane. Other than that, it was the regular routine. 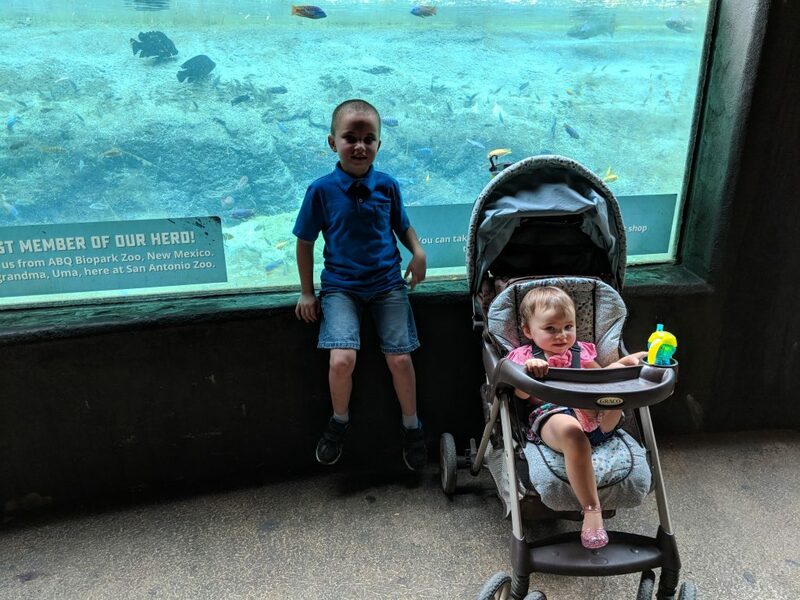 What Joseph’s Been Up To: He had a fun time at his awards ceremony as well as at the zoo (since they let us take him out of school early, we decided on a spontaneous zoo trip). 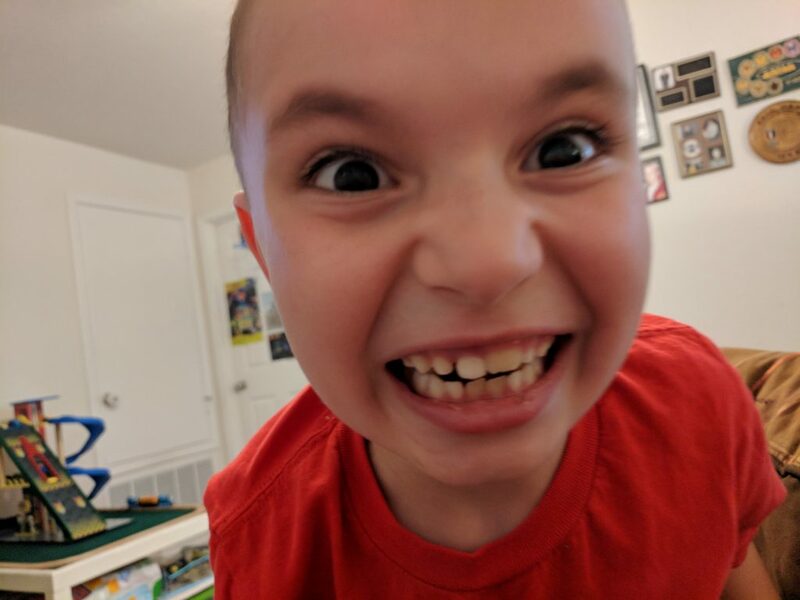 He also had a ton of fun at a friend’s birthday party today (a lot of friends, a bounce house…yeah, I totally get why he had a blast). 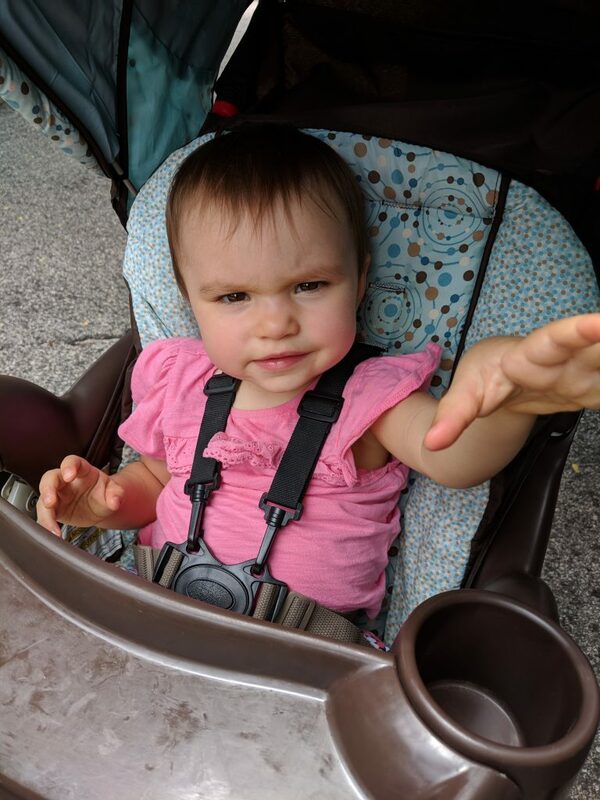 What Abigail’s Been Up To: She has started pointing to things and saying, “That?” so that I can tell her what it is. 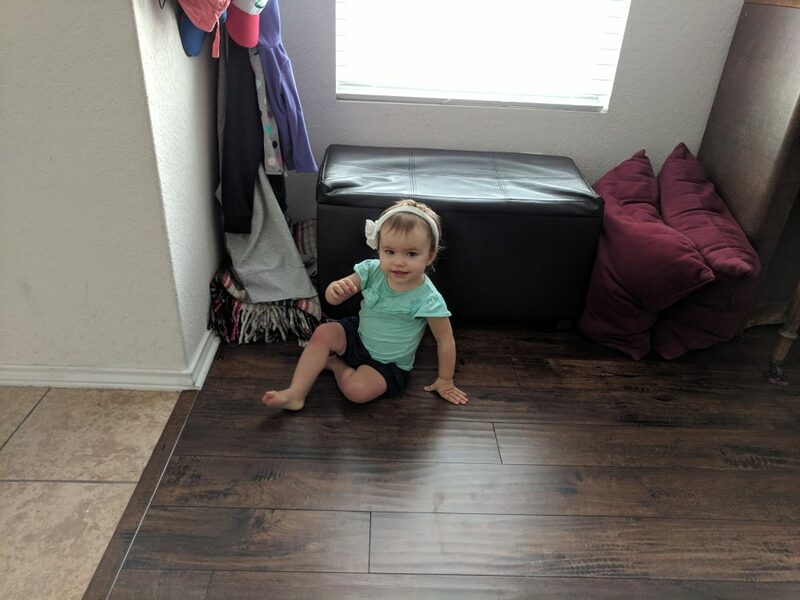 She also is taking more tentative steps on her own. Oh, and she really likes to try to put her clothes on. 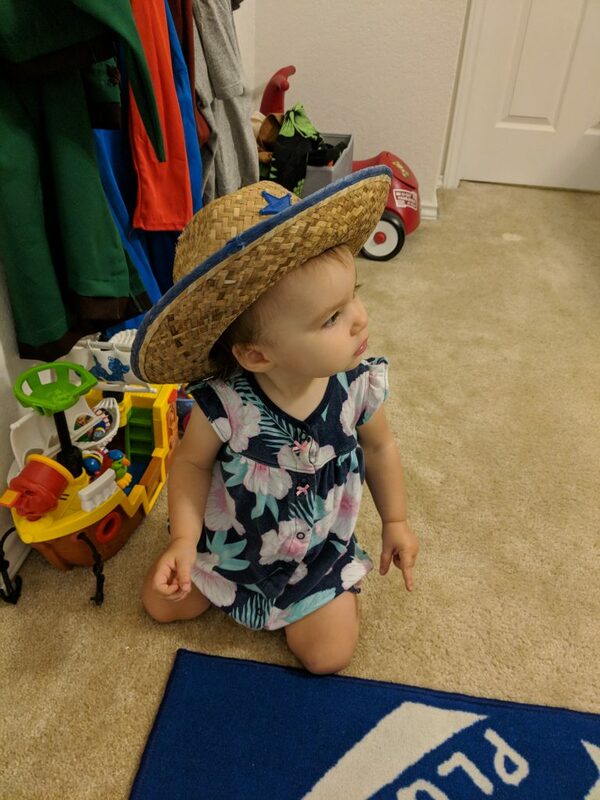 She also likes to pick her clothes. I’ll hold up two options of something and she’ll either shake her head “no” when I offer one or she’ll take both and then give me the one she doesn’t want. She’s actually getting really good at shaking her head “no”. She’ll do it if I offer her more food and she’s full, or if I offer a toy and she doesn’t want it, etc. It’s hard to believe that in just three Sundays she’ll be old enough to go to nursery at church. Our new loft set-up. I would have never thought to arrange it this way, but I love it! 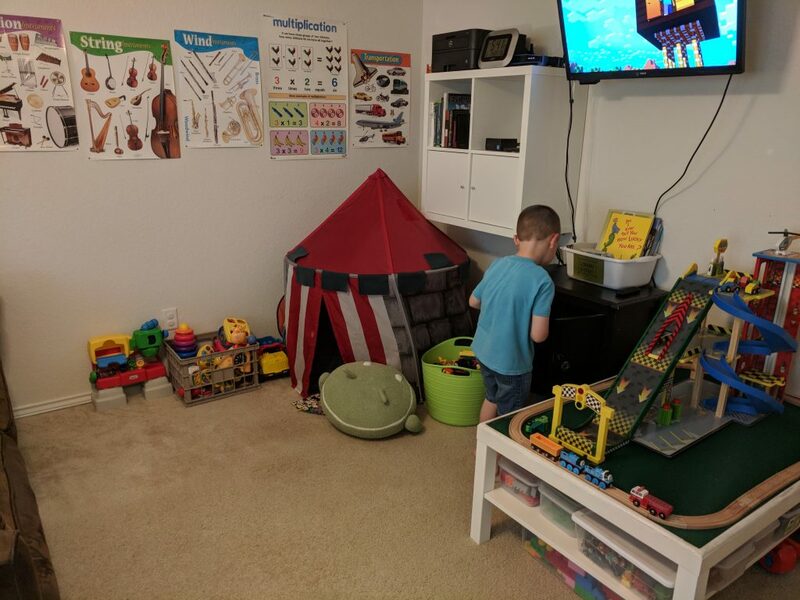 …and then another playing area over here. 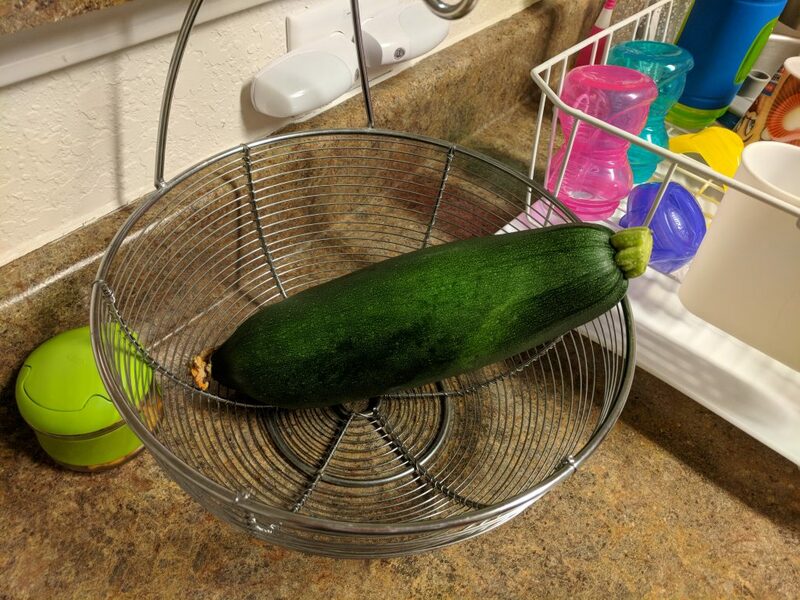 My zucchini sort of grew…a lot…when I wasn’t looking. I used it to make two loaves of zucchini bread, which turned out delicious (I knew it wouldn’t be good to eat in normal form since it was so big). I love it when birds visit our yard. 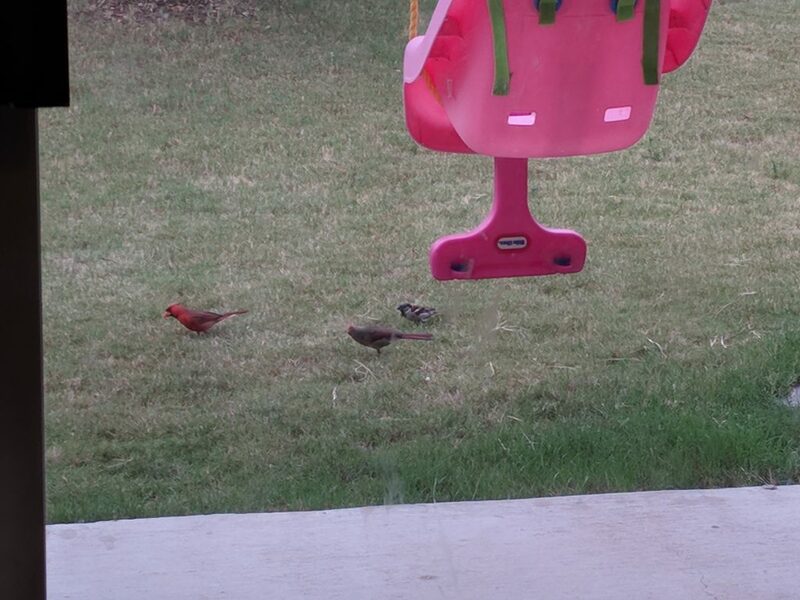 This particular time was two cardinals (male and female) and a finch. I watched as the male cardinal found a large bug (I think it was a beetle) and immediately hopped over and gave it to the female. Chivalry at its finest. I also watched as the finch tried to take the beetle from the female cardinal and got pecked by her for its attempt. She showed that she could hold her own, haha. 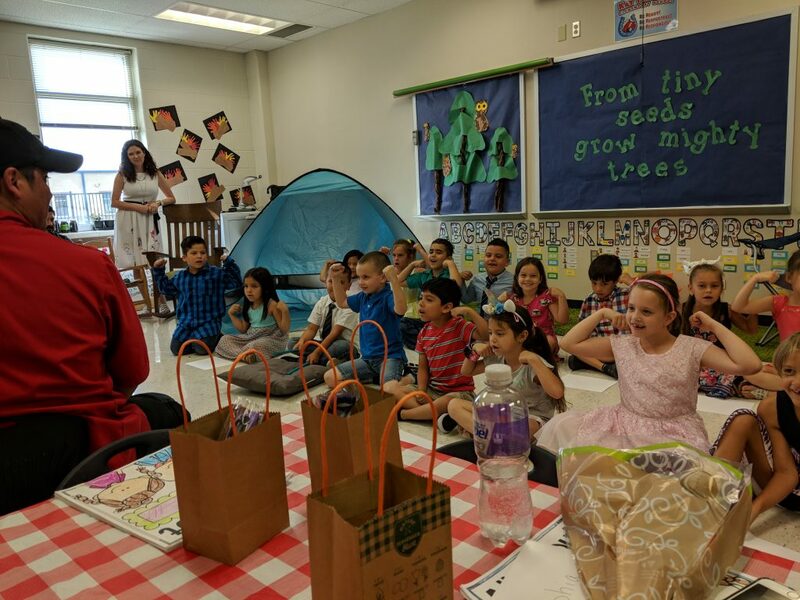 Joseph’s class sung a song for the parents before the awards (the awards ceremony was camping themed, which is why the room is decorated the way it is). The song they were singing talked about being strong. He got the Most Inquisitive Award. Very fitting! Y’all. His teacher was amazing. 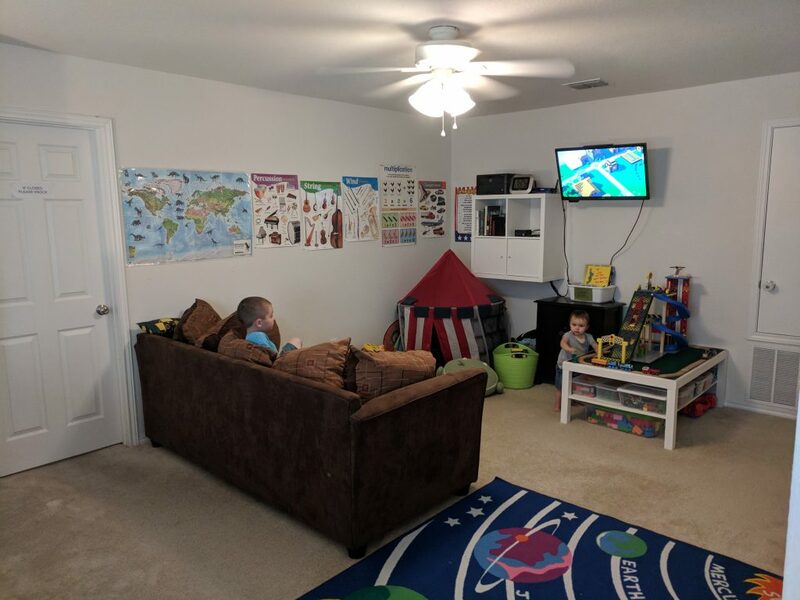 She pushed him just enough that he improved without getting frustrated, made sure he was always engaged in what they were doing, and made learning so much fun. 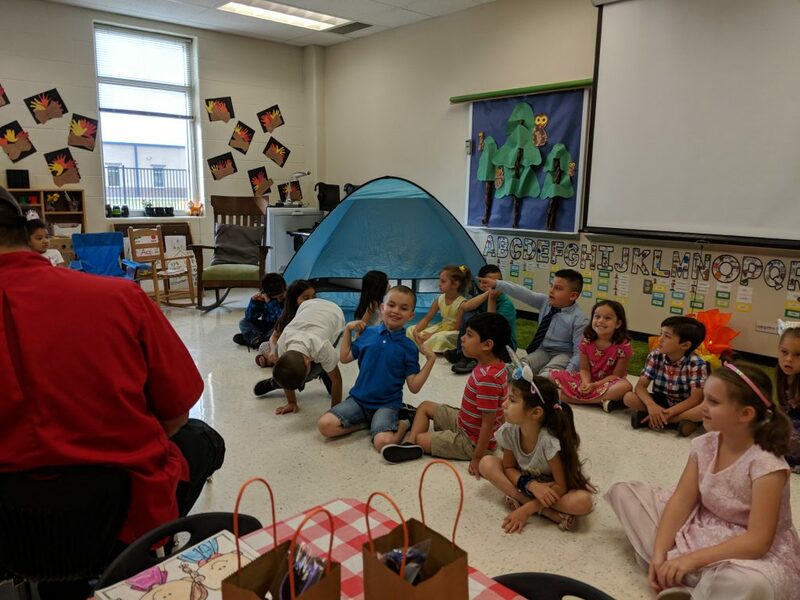 We struck gold with Ms. Adams! 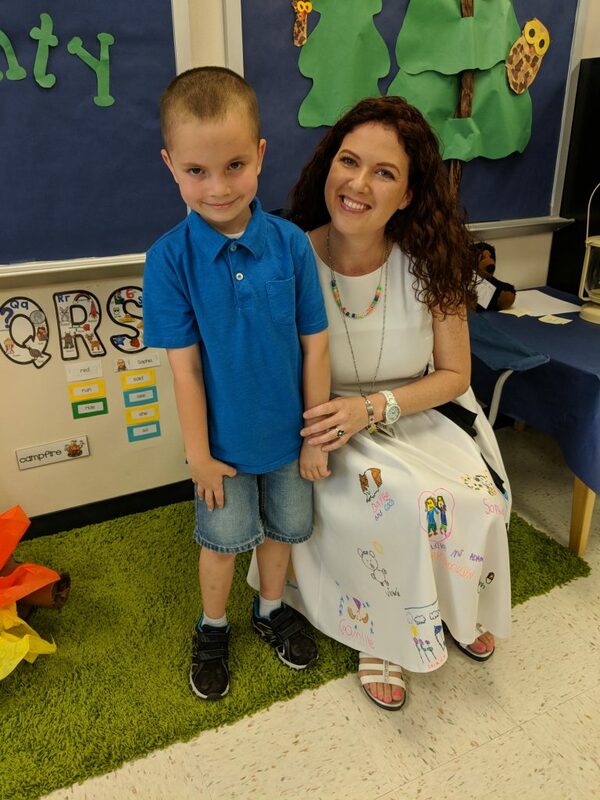 And can I just point out her dress: those are pictures that each of the students drew on pieces of cloth with fabric markers that she then ironed onto her dress.That made me cry a bit. I love that he had a teacher that truly loved and cared for him for those many hours that he was away from my love and care. 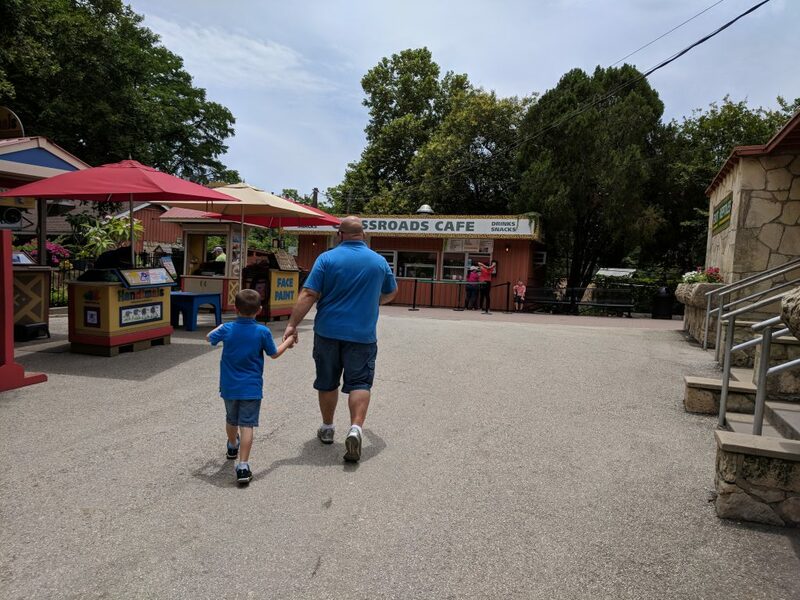 Walkin’ with Daddy at the zoo. This bear had the right idea. 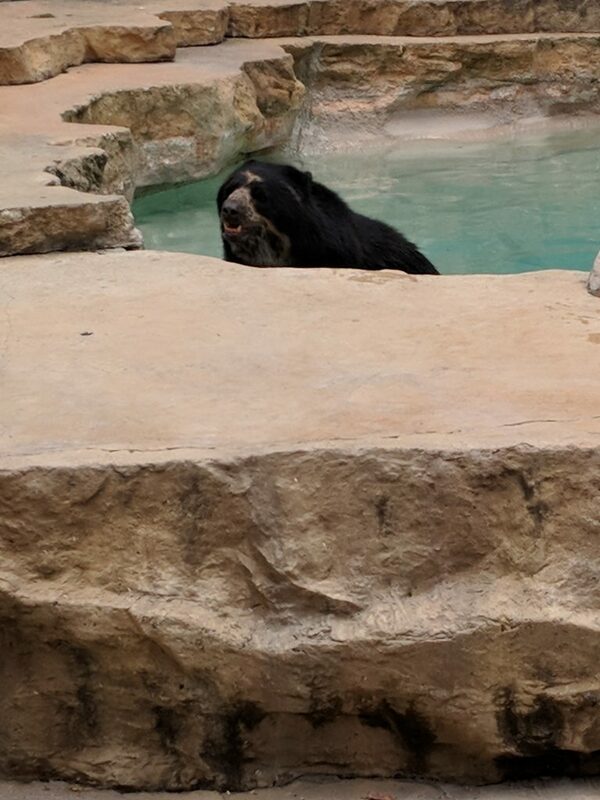 He was just chillin’ in his pool. 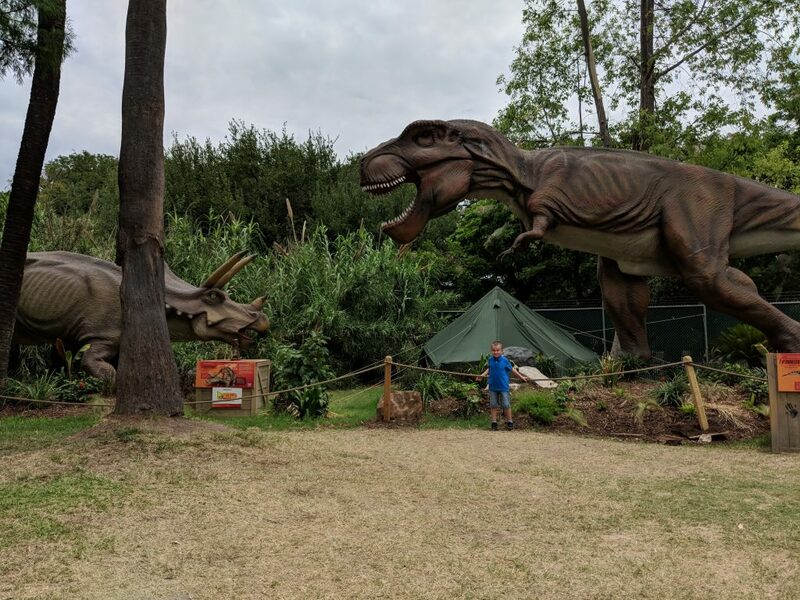 With some more of the animatronic dinos that are all over the zoo. 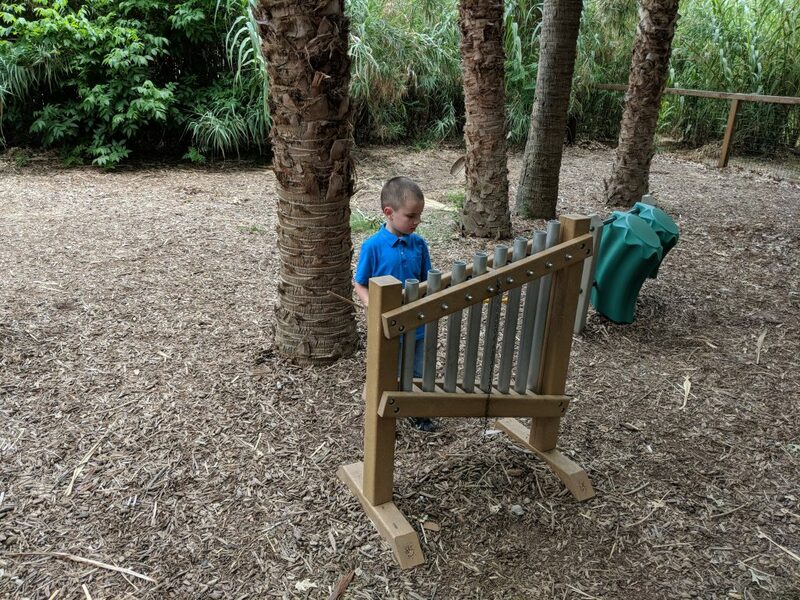 We discovered this part of the zoo that had metal musical installations. 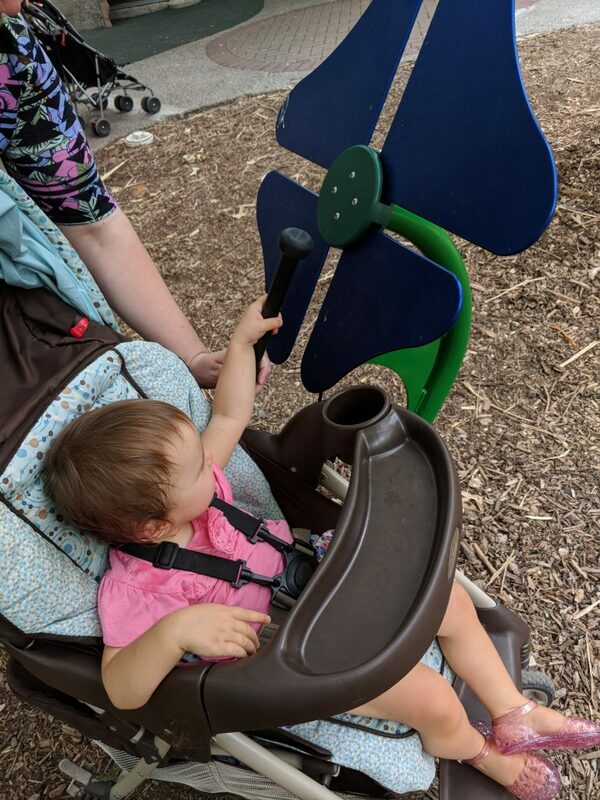 Abigail liked using this mallet to hit the flower petals. Joseph liked this one the best, I think. 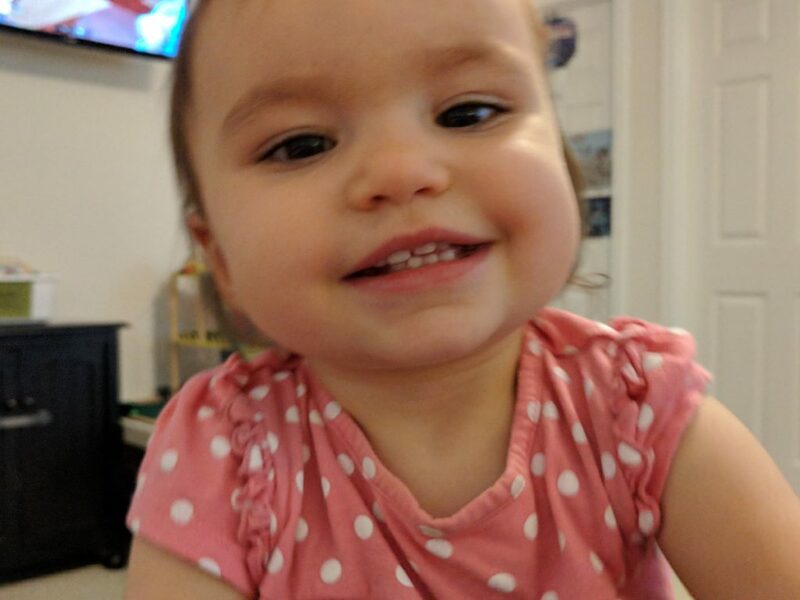 Trying to get Daddy’s phone. Cooling off in the hippo area. 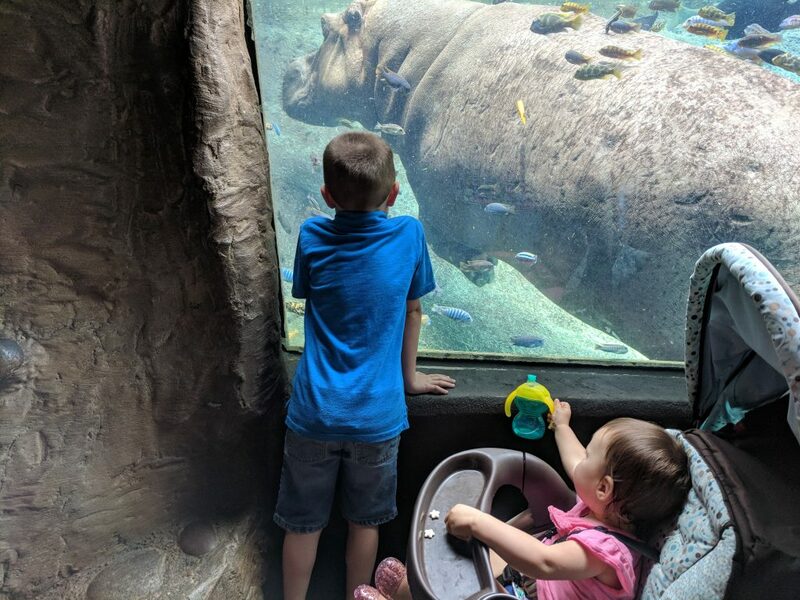 They were sitting there, watching the fish swim by, and then all of a sudden one of the hippos just walked by (I find it fascinating that they don’t actually swim; they walk along the bottom). I love his crazy personality.